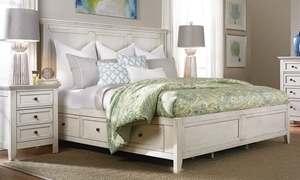 Romantic carvings and fresh linen accentuate the head and foot of this white oak queen poster bed in a natural, wire-brushed hand finish. 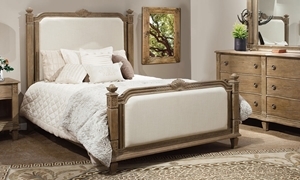 Romantic carvings and fresh linen accentuate the head and foot of this white oak king poster bed in a natural, wire-brushed hand finish. 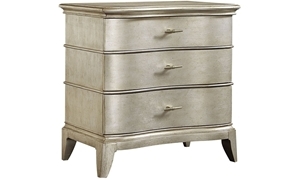 Wide serpentine nightstand with three full-extension drawers and hidden USB charging port in a gently aged and glazed metallic finish. 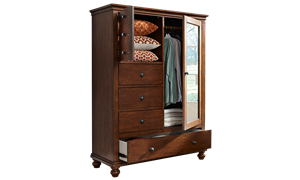 Versatile wardrobe in a whiskey finish offers a plethora of storage options with four full extension drawers, two cabinets and a mirror. 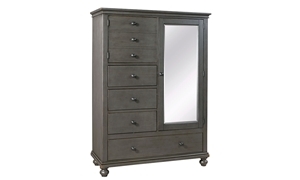 Supplement your dresser storage or closet space with this gray armoire, featuring a mirror, four full extension drawers and two cabinets. 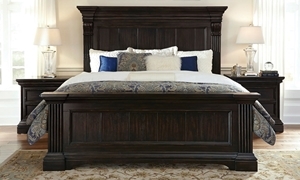 Stately king size bed features traditional crown molding, corbel blocks and reeded pilasters in a sophisticated smoked molasses finish. 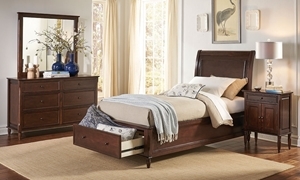 Queen storage bed crafted from pine solids in a weathered charcoal finish features two spacious footboard drawers and aged iron accents. 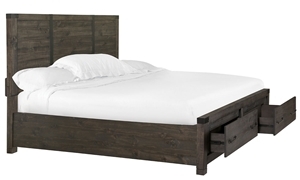 King storage bed crafted from pine solids in a weathered charcoal finish features two spacious footboard drawers and aged iron accents.